It was Halloween, 1967, not quite three months since my 18-year-old brother, Tom, had passed away. My parents were deeply grieving the death of their eldest child while caring for the remaining four of us. Dad and Mom had been out, taking the younger kids trick-or-treating. When they pulled into the driveway Mom noticed a couple of strange looking characters on the front porch. They seemed too big to be kids, but they looked pretty odd and Mom was curious about them. When she got to the porch she realized that the strangers were actually two of her very good friends, Dolly and Sarah, in oversized, mismatched clothing and goofy hats pulled way down over their eyes. "Come on," they said, "we've come to take you trick-or-treating!" Mom gave them plenty of excuses -- she didn't feel like it, she didn't really want to, she didn't have a costume. "Oh, yes you do!" they said, as they pulled an entire outfit, just as goofy looking as their own, from a bag. Finally she relented. And she had a wonderful time. She considers it one of the greatest kindnesses she received during that period of grieving. Those dear friends pulled her out of herself that night, allowing her to laugh and reminding her that she would be okay. 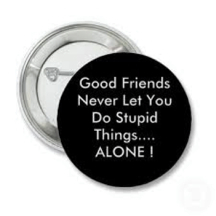 There's nothing like good friends! 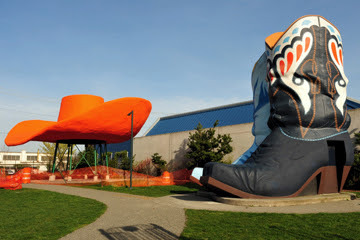 A Seattle icon for over 50 years, Seattle's Hat and Boots is true Americana. You will enjoy this delightful video about the history of this piece of Seattle's culture, produced by the Seattle Channel. I couldn't have been more than five the day the piano showed up. It was one of the great surprises our parents liked to do for us kids. In those early years it was covered with a bumpy white naugahyde, and the piano looked like something you might see in the lounge of a restaurant in the 1950s. 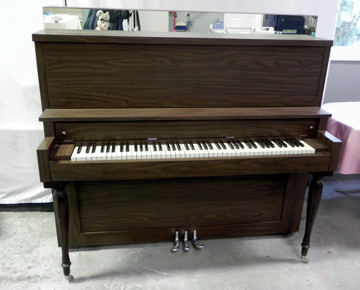 Dad and Mom eventually took it apart, refurbished the keys and strings, and recovered it in walnut formica. It was the centerpiece of our living room. The top of the piano was always a focal point for our Christmas decorations, with spun glass "angel hair" covering the top and the shelf, small lights reflecting in the mirror, and a collection of porcelain choir boys and angels on display. That's how it was, except the year that we had to put the Christmas tree on top of the piano so the twins wouldn't knock it down! Tom and I took piano lessons from George Rhoads, the grandfather of church friends, and the spitting image of the Rainier Beer Brewmaster. He came to our house each week and guided us through an hour of piano. He was a gentle, good teacher, but I wasn't ready for the structure of the lessons, and struggled to make progress. I quit piano lessons. Eventually all five of us kids had at least a few lessons, and each of us learned to play. As for me, it took a couple more teachers and a lot of determination. I would sit down to play and, chord by chord struggle through an entire hymn, taking so long that no one could remember what the song was supposed to be by the time I reached the end. After years of dogged determination, I got to the place where I can play decently. As an adult I bought a piano from my friends Danny and Glenda. It's also an upright, heavy and difficult to move. So for years it was at the home of my friend Kris, waiting for us to reclaim it. We'd had it back for a year or so and I'd walk past it several times a day but was always too busy to stop and play. One particular day, in the midst of the stress and turmoil of life, I stopped at the piano rather than pass by. A couple of notes just above middle C were stuck, so I started running my fingers over the notes an octave above. I picked out a tune and found that a song came spilling out of me. Playing it on the higher notes gave it a lightness, a sweetness that fit the melody. Based on Psalm 23, I wrote a song that has quieted my heart on many occasions. Other songs have followed. Most flow out of a specific experience and are based on scripture. It was a gift from the Lord that I never expected. I'm no virtuoso, but I am so grateful for our old piano and the encouragement of my family to just play at my own pace. Surely this is one of the sweetest gifts I have ever received. 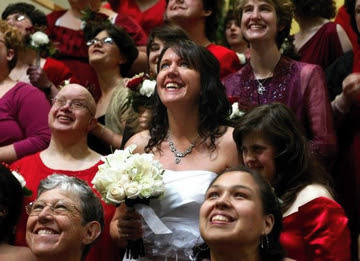 I've never seen happier bridesmaids -- all 30 of them! They stood with Kinder Holdaway as she was married at 4:00 on Saturday, October 22, to Jim Smoots. Among Jim's two dozen groomsmen was our son Samuel. It was his 20th birthday. As Executive Director of Eagle Wings Ministries, Kinder works to bring Snohomish County's developmentally disabled adult population together with the community at large. Jim is a PE teacher and coach at Arlington High School. 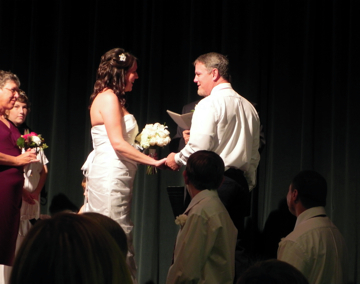 They met in January of 2009 when Kinder was at Jim's church, sharing about Eagle Wings. On Christmas morning, 2010, he proposed. Kinder wanted to share this special day with the many friends she has made over the past eight years she's been a part of Eagle Wings, and Jim agreed. So after they announced their engagement at the annual Valentine's Dinner earlier this year, they circulated through the crowd with a clipboard, signing up whoever wanted to be in the bridal party. For most of the participants, this was the first time to be in a wedding. The men were dressed in white shirts, black slacks, black shoes and ties. There were plenty of extra red ties on hand, just in case one of the guys didn't have his own. 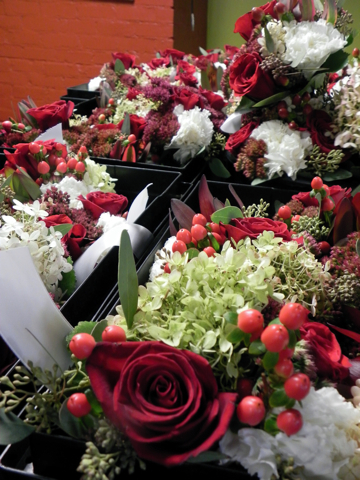 The women wore red dresses of their own choosing, which looked beautiful with their boquets. 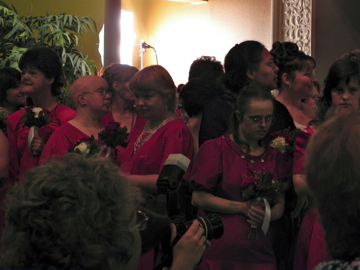 Volunteers were on site to do the women's hair and make-up, and to help the guys with their ties and boutonnieres. The flowers, the food, the co-ordination, the church, were all gifts to the bride and groom from New Life Foursquare Church in Everett. My family stopped by to see Samuel and the other men while they waited for the wedding to begin. Oh, the energy in that hallway! It was the same kind of holy chaos that I felt in the women's lounge as they were preparing! 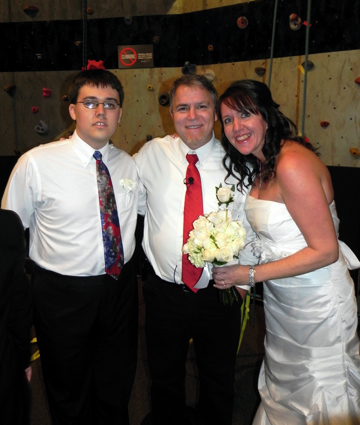 We were among the 200 guests who experienced the joy and excitement of this special wedding celebration. From the moment the first pair of attendants walked down the aisle till the processional, the atmosphere in the chapel was electric. Family, friends and proud parents watched as the men and women were paired to walk down the aisle. 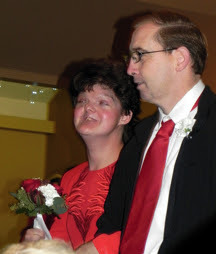 Henk Wapstra, Eagle Wings' founder and Kinder's dear friend, walked her down the aisle and performed the ceremony. 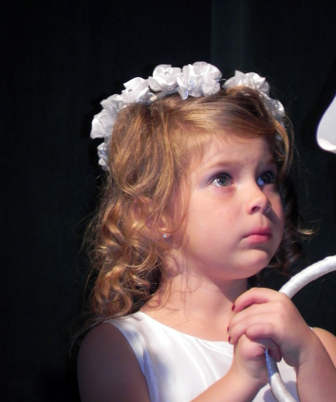 Her 4-year-old granddaughter was her flower girl. A reception followed. And, like at most every Eagle Wings events, there was dancing. The party ended at 6:00, when DART buses and families and caregivers whisked the tired participants home. The party ended, but the joy of this day, the day Kinder and Jim got married, will last a lifetime. You can click here to read a wonderful article that appeared in The Herald on Sunday morning, and see more photos like the one at the top of this post. We heard Duane Funderburk and Alex Russell, The Los Angeles Collaboration, last night. Oh, it was glorious! Duane Funderburkis a graduate of Seattle Pacific University, and he was in Seattle to honor his former piano teacher, Marcile Mack. She certainly taught him well! He went on to study at Boston University and at USC. His piano artistry and his thoughtful, powerful arrangements, full of life and grace, were very moving. Alex Russell transports you to another place with his delicate, compelling violin playing. He glides effortlessly to the highest possible notes on the violin, creating a lovely contrast to the lower notes drawn with a full, steady bow. I couldn't suppress my joy as I listened to these two gifted musicians. They have played together across the country and around the world, yet last night's performance seemed as fresh and exciting to them as it was to the audience. After the performance they chatted with concert-goers and were personable and appreciative of the many positive responses they received. 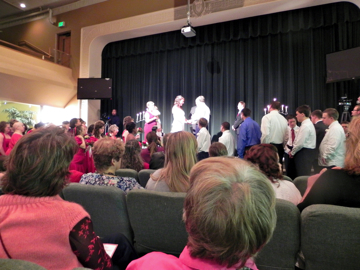 The concert consisted of classical pieces, hymns, and a couple of Gershwin numbers. They were joined by an 18-piece orchestra for the second half of the concert. 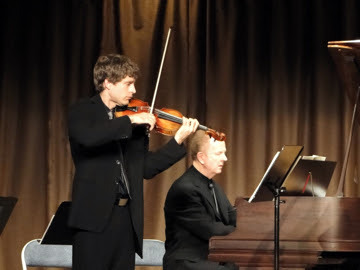 Some of the orchestra members were current or past SPU students, a few were faculty members. Others were friends of Patrice Weed Shearer, SPU alumnus and concertmaster of the Everett Philharmonic Orchestra. And a contingent -- students from Central Washington University in Ellensburg -- arrived at 6:00, just in time for the only rehearsal. You would have thought they had spent weeks in preparation for the concert but a few had never seen the music before! Such accomplished musicians. 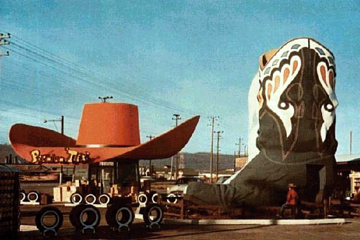 Indeed, the entire concert was a tangible expression of the name, The Los Angeles Collaboration. Many thanks to all who worked together to bring such a fine concert to the area. They will be in the Northwest through Monday evening. If you missed the concert and would still like to hear The Los Angeles Collaboration, or if you'd like to order a CD, check out their website. On Facebook the other day, several of my friends posted a list entitled "Ten Ways to Love." I have put them in a slightly different order, and I have written out the scripture that was included, with an occasional thought of my own. It is a good reminder of what it means to love, in a very practical and biblical way. It was the power of God's Word that forever changed Max McLean's life. 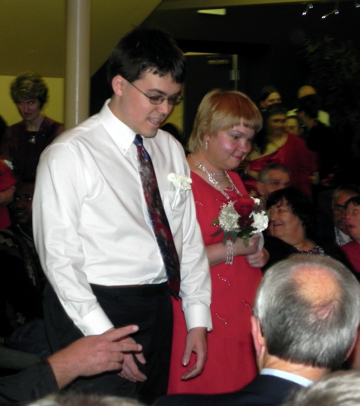 Raised a nominal Catholic, Max walked away from all things Christian as a young teen. Years later Sharon, the young woman who would become his wife, took him to a Bible study where he was drawn to the scripture passage being studied. "I remember the words of the text hit me as passionate and forceful," he told Tim Challies in an interview. "I had not been confronted by the power and insight of the Bible prior to that. From that moment God began to work in my life and convict me of my sin. At first I wanted to run away, but I couldn't. Then I read John's Gospel -- in one sitting. As I read it, I could see and feel it in my mind's eye. I thought Jesus was going to come right out of the pages of the Bible an take me with him. At his crucifixion I was in tears. But after the resurrection appearances, an inexplicable joy just overwhelmed my whole body. I knew this story was true and that my life would never be the same again." Since that time Max has used his passion for scripture to shape his career. He has narrated the Bible in three different translations -- NIV, ESV and KJV. His narrations of the scripture and his stage performances of Genesis and Mark's Gospel powerfully combine his theological understanding and dramatic expression that draws people in. Just like the scripture did for him so many years ago. Max is currently traveling with The Screwtape Letters, a stage adaptation of C.S. Lewis' witty and thought provoking book. McLean makes a marvelous Screwtape, and the show is receiving rave reviews wherever it plays. November shows are scheduled for Memphis, Miami and Dallas. Check it out here. I've never been much good at dickering. I take things at face value; if an item costs $50 I decide if it is worth it to me to pay that sum for that product, but I do not offer less. It simply never occurs to me! So I wasn't prepared for the amount of haggling that went on at the garage sale at Dad and Mom's last weekend. Our prices were low, our merchandise was quality, and I figured people were getting a great deal if they plunked down exactly what we asked. I forgot that price-negotiating is a national sport in some countries. When a lady wanted two full sets of china dishes, one priced at $20 and the other at $25, for $30 total, we said "No." When she raised it to $35, we said "No." We wouldn't give it to her for $40 either, but when she found three bottles for 25 cents each and offered us $45 for both sets of dishes and the three bottles, we were glad to oblige. Later a man stopped by with the same sporting approach. 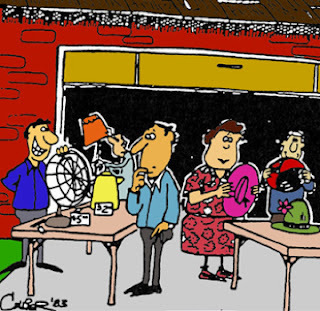 He made offers on several items, and we were able to work out a deal that seemed to satisfy him. He paid me for his purchases, then realized that he had missed a room. He wouldn't leave until he'd seen everything. 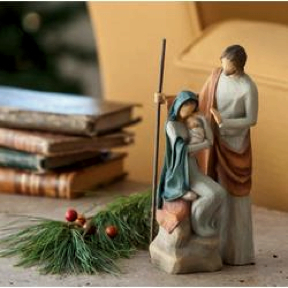 His eyes fell on a figurine of the holy family. Picking it up gently, he studied it for several seconds. Then he brought it to my sister and pointed at Joseph. "Yosef?" he asked, then, pointing to Mary, "Maria?" Yes, Peach told him, it was Joseph and Mary. As he pointed to Jesus, he loving uttered his name in his own language. "Yes, baby Jesus," Peach replied. The man set the figurine on the table and reached into his back pocket, pulling out a crisp $5 bill, paying us the full price. No dickering. Off to Mom and Dad's today to help with a garage sale. Stop by today or tomorrow if you're in Marysville! We've just discovered fennel. I'd heard of it, perhaps even bought fennel seeds, but I don't remember ever cooking with it before. The other day as I was looking through my recipes, two jumped out at me, a bean and fennel soup and Fennel Slaw. So I stopped by Haggen's produce section and found a fennel bulb. It's a goofy looking vegetable; it looks like celery stalks topped with green feathery leaves growing out of an onion. It has the aroma of licorice and has overtones of licorice taste as well, especially when eaten raw. The Reader's Digest book, Foods that Harm Foods that Heal, says that "the licorice flavor goes especially well with fish; try baking or grilling it on a bed of fennel stalks. All parts of the fennel plant are edible, and it can be prepared and served in many ways; raw in salads or braised, steamed, baked or sautéed as a side dish. Stuffed and baked fennel bulbs are a flavorful vegetarian entree; the chopped leaves make a colorful and nutritious garnish for tomato soup and other vegetable dishes." 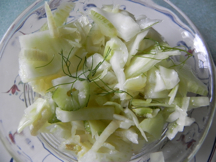 We started with the fennel slaw, a recipe I found in the Skagit Valley Food Co-op's June/July 2000 Natural Enquirer. Jayne Alynn discovered it in a restaurant in Oregon and thought it sure beat the "soggy cabbage and carrots in a soupy pool of mayonnaise" that we often think of as slaw. I'd have to agree with her (with my mom's cabbage/carrot slaw being the exception!). Here's the recipe, as it appeared in the Natural Enquirer. tops for later. Toss with the dressing. Whisk together one-quarter cup white vinegar (white balsamic, white wine, or white sherry vinegar) and about a teaspoon of honey (you can also use sugar) until dissolved, then whisk in an equal amount of olive oil. Mix until the oil is blended in. Add salt and pepper to taste. She suggests you cut the fennel and the cabbage with a sharp chef's knife rather than using a food processor. 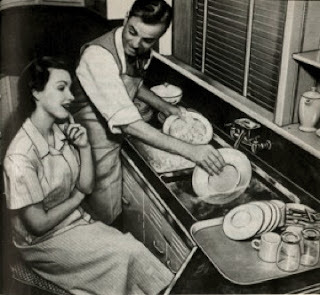 And she also recommends that you prepare the salad and refrigerate several hours (or overnight) before serving. Be sure to pour any water that has settled in the bowl before you serve. You might also snip the leaves into the bowl and toss, just before serving, for an extra flavor burst. We served it for dinner last night and everyone found it delicious! 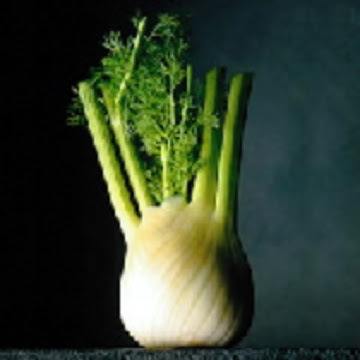 Fennel is an excellent source of vitamins A and C (especially the leaves) and potassium, calcium and iron. It's high in fiber and low in calories. It is said to be good for stomach ailments, coughs, colic in babies, and aids in lowering blood pressure. Their Seattle performance will be a tribute to Marcile Mack, SPU music professor under whom Funderburk studied piano while he was a student there. The first half of the program will feature the duo of Funderburk and Russell, as well as a piano quartet, while the second half will include an 18-piece orchestra joining them to play several of their own arrangements. You can listen in on a practice and recording session to get a sample of their music. I hope to see you at the concert. Well, I had thought I would talk about art today, but I still have some things to think through before I actually post my thoughts on the subject! 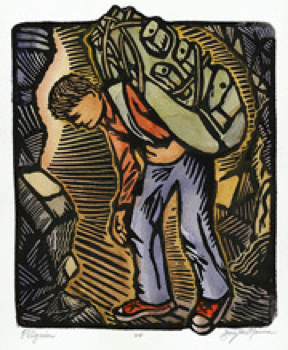 In the meantime, click here to see artist Gary Nauman, a block printer, share his creative process of making his linocut print, Pilgrim. We saw Courageous over the weekend. 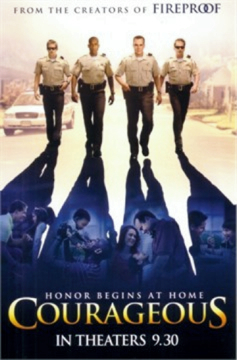 From the carjacking that opened the film to the last credit, we were drawn into the story of Adam Mitchell, a police officer in Albany, Georgia, his family and his fellow officers. During the work shift, they fight crime and do paper work, and off hours their friendship develops. When tragedy invades their lives, they begin to take seriously their role as fathers and take a step that will help them become courageous men who take their fatherhood seriously. Number four at the box office over the weekend, this is the fourth major movie made by Sherwood Baptist Church. Their first three were Flywheel, Facing the Giants, and Fireproof. The productions are low budget (this one was $2 million, but the others were less than half that), but you wouldn't know that by the cinematography. The filming was great and the action scenes exciting. Most of the Sherwood Pictures actors have been volunteers from the church, but this film included some outside actors as well, people who were invited to audition. In spite of being volunteer actors, I found the characters to be well-developed and well-played. I especially liked Javier, an out-of-work dad who was desperate for a job. He offered wonderful comic relief and added a great deal to the film. The National Fatherhood Initiative has found that "kids who live absent their biological fathers are, on average, at least two to three times more likely to be poor, to use drugs, to experience educational, health, emotional and behavioral problems, to be victims of child abuse, and to engage in criminal behavior than their peers who live with their married, biological (or adoptive) parents." This is a serious issue, and the need for fathers to step up to their responsibility is urgent. The message comes through loud and clear in Courageous. That was the strength of the movie, and that was its weakness. For people in the church, this message is being well received. Men and women are seeing the film and facing the reality of the need to be more present as parents (especially fathers) and to lead their children in the faith. But I think folks who are not followers of Christ will find the film to be preachy and that will put them off. I've read many reviews of the film and the comments those reviews inspire, which reflect my thoughts. It seems that there must be a way to tell this story, raise this concern, that will not alienate non-church folk. How to create art that is both Christian and winsome, that speaks to the church while presenting the message to those who are outside the church in a way to draws them in -- this is the great challenge. More about that on Friday. Here's some good news for you today: God will take care of you! Sung by children from the Michael Children Home in Nadu India.